If your planning you vacation to Thailand’s most popular Island, then use our guide of where to stay Phuket. We aim to showcase the best areas to stay in Phuket and the benefits of each. Whether your planning on relaxing, enjoying the nature, diving in the marine parks or here to party, then we can show you where to stay Phuket. Being Thailand’s largest island Phuket has many different areas to choose from, and getting from one end of the island to the other can be both troublesome and expensive. Public transport outside the main areas is both infrequent and unreliable. Taxis are the main method tourist use to get around, but these can expensive. This all makes it essential that you choose the right area to stay in Phuket. Our guide to where to stay Phuket, will ensure that you are conveniently located to make the most of your time on the island. Patong is the Island’s center of tourism and is set aside the busy 3 km Beach of the same name. The center of Patong is Bangla road, running along the side of the beach, this is a party animals heaven. During the day the area around Bangla road is busy with beach goers, shoppers and those out for a spot of lunch. At night the surrounding area turns into a neon lit hedonists macca, with bars and clubs everywhere you turn. For the younger traveler this is the perfect area to stay in Phuket. However for most it is far too busy and noisy to reside in. For those of you looking for a quieter life whilst still being close enough to the action without being in the middle of it then consider staying a little further out than Bangla road. 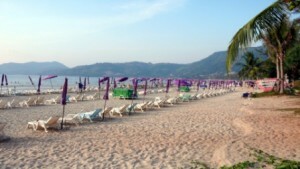 A lot of the larger more resort style hotels are located at either end of Patong beach. Here the beach is less crowded and the nightlife is more sedate. Staying here means you are not disturbed by the large crowds and noise of central Patong yet are only a short stroll along the beach from the action. Patong is also a great location for those looking to explore the rest of island. Making it a perfect place for those who want a little bit of everything during their trip to Phuket. A little further south from Patong lies the beach town of Karon. Although not as large as Patong, Karon still has plenty to offer those staying here. The town mainly consists of two main roads and its stunning 4 km long white sandy beach. If your looking for some where to stay Phuket that offers you luxury hotels and resorts set in a picture postcard scene then Karon beach is where you’ll want to be. The white sandy beach is in pristine condition and is lined by the larger more famous 5 star hotels, many of which have their own private sections of the beach. A lot of the large resorts here don’t allow under 12’s. There are many privately owned small restaurants and quiet bars dotted along the beach and around the town, but the nightlife is somewhat subdued and relaxing. More romantic than party. Karon beach is the perfect area to stay in Phuket for honeymooners, romantic breaks or spa style weekends. A little further south again is Kata beach and Kata Beach noi (Kata beach small). This is a slightly smaller town than Karon, in fact it’s probably more akin to a village than a town. Both the beaches and the town are quieter than both Karon and Patong and their is much less traffic in the area. Kata is actually 2 beaches both of which offer clean white sands, protected waters and plenty of shaded areas. The hotels here are more geared towards the family visitor and offer resort style facilities. The town has a reasonable collection of shopping, restaurants and bars and for those who want a little more the center offers reasonable priced Tuk Tuk rides to Patong during the day. Kata beach is where to stay Phuket for families. Situated to the north of Patong, lies the medium sized town of kamala. The town hasn’t been developed with tourism in mind. The main residents here are Thai and expat families. This in our opinion is the real draw of staying here, away from the tourist masses it lets you experience a more realistic version of Thai life. In the town center itself there a few small hotels and guest houses as well as few restaurants and shops. For those looking for larger resorts and a little livelier nighttime entertainment then you will want to stay nearer the beach where there a few large hotel resorts. Sitting atop the hills over looking Kamala bay are a few of Phuket’s most luxurious adults only resorts and spas, ideal for those couples looking for pure relaxation in a sublime setting. Kamala is where to stay in Phuket in to get away from it all and completely unwind. Lying a little further to North of Patong is Bang Tao bay, and its quiet 6 km long powdery white sandy beach. Development here has been heavily regulated and restricted it. The area is very quiet and offers very little shopping or nightlife outside of its 6 main resorts. There a small handful of restaurants and bars scattered around the village center. The beach is one of the best beaches on Phuket and each of the resorts has it’s secluded section with the southern tip open to the general public. If your the kind of traveler that like to get to your resort and stay there most of the time then this is the area for you. The resorts are large yet very private and offer every amenity the discerning traveler requires. Chalong harbor is the main port in Phuket and as such isn’t really on the tourist map. The town like many ports all over the world is not that pretty. The main attraction for staying here is access to the port, if your planing on any form of water based activities then being here will a major convenience for you. Located to the South East coast Chalong is not an ideal base for those looking to explore the rest of Phuket. But anyone who wishes to charter a boat to the islands or marine park, plans on a diving course this is where to stay Phuket.